If you need industrial paper, we’ve got you covered inside and out. Oren International offers paper solutions for a range of industrial use applications such as: Paper Tubes, Cores, Cornerboard, Bags, Boxes, Envelopes and Industrial Liners. 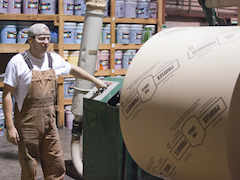 Choose a recycled linerboard product without sacrificing quality. Recycled natural linerboard is made of 10% recycled fibers. It performs best in tube and core form. Common basis weights are 33# through 57#. Linerboard is heavier than Kraft paper, and is manufactured for the purpose of making corrugated cartons, or your average cardboard box. Linerboard can be used for floor covering, pallet liners, interleaving and slip sheets, as well as a protective over wrap when shipping products. Standard basis weights available are 23# through 90## (MSF). Please call for pricing and sizes. Newsprint is a clean, smooth sheet that can be used for a range of applications such as wrapping fragile items and dunnage. It can also be used as sandwich wrap as long as a PE sheet is used on the inside. Call for more details. White on one side, brown on the other, white top linerboard dresses up the outside of containers. The white outside creates a great foundation for custom printing logos. Basis weights are 26# through 69#. All are available in rolls or sheets. Chipboard is made from recycled fibers and is used for interleaving, pallet lining, laminating and notepapad backing. Chipboard has a smooth, uncoated surface on both sides and the color varies depending on the recycled fibers used. Various calibers are available. Please call for availability. A number of grades of paper can be custom coated with polyethylene or moisture/vapor barrier applications to keep food and other products safe. Paper can also be laminated to paper depending on the application requirements. Pigmented poly (white or black) and clear polycoated papers are available. Scrim, also known as reinforced Kraft Paper or tri-directional fiberglass scrim, is sheet paper reinforced with open mesh, textile or glass fiber threads. Scrim is a strong and flexible product with diverse custom applications. It's used to reinforce many industrial products such as roofing, filters, carpets, air-ducts and tape. Edge protectors are also referred to as angleboard, edgeboard, cornerboard or cargo edge protectors. Heavy-duty edge protectors are used to stabilize strong-wrapped or strapped loads and add extra support to double stacked pallets. Learn more about our edge protector products. 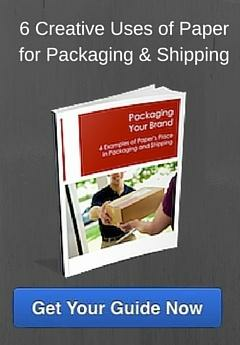 Download our free e-Book for creative and affordable uses for paper as a branding tool in packaging and shipping.